Another day, another sunrise, another reason to move forward. Time seems to stand still as you gaze out at the morning sunlight reciting your prayers. The green hills of Equestria seem almost golden in the light. Today you are in a town on the outskirts of Candterlot, a place called Evercreek. A set of hoof steps meets you on the balcony. "Radiant." an old voice says hurriedly. "There you are. Or then you are. Well either way I've located you, are you preoccupied in this time?" Indeed you are actually not that busy, you've already made certain that the temple you assisted in building, got the supplies it needed, and decorated it with Celestia's sun as much as possible and while lacking faith these ponies are not in any danger. You glance up at the voice, as expected its a bearded unicorn, his flashy outfit covered in stars and his hat decorated with bells. "You could say I've got all the time in the world, Starswirl." He nods. "Good, good. I could use your help. One of you should be enough." The sunlight feels warm and soft on your mane. Take a deep breath of the fresh air while I'm here. Better enjoy all the calm moments I have. "Just a few demons, nothing you can't handle if I set you down at the right time, before they really get moving." It really is soothing, the morning sun, the warm breeze.. You can see a few foals frolicking on the hills, seems like they are eager to have adventures of their own. "Right. Are they part of any cult we know?" Such innocent times, you can nearly picture it.. perhaps this temple will inspire the young ones to a greater cause when the time is right. "They call themselves Tartarus's Children." I'm sure it will show them how great Princess Celestia is! "I'm not entirely sure what their true motive is, but they have been, or will be, collecting the Keys to Tartarus. Artifacts once used to lock away the demon spawn from our world. Allowing these keys to fall into their hooves could destroy what we have here." he gestures to the hills. "I will not let that happen. Where do I start?" "just short of 300 years before you were born." Star swirl's horn light's up and you feel the world spin around you. You find yourself in the middle of a forest, still on top of a hill and a little disoriented. "Go south from here, there should be a cave where a unicorn named Lilith is holed up." he points you in the right direction. "And don't talk to Celestia, she isn't supposed to know yet." "No talking to her? Not even a bit?" "Lilith is a unicorn mare, she is white furred, blue maned, and blue eyed. She has, or will soon, made a deal with a demon." To your question he nods. "Do whatever you feel you need to Radiant. Just be sure to recover any keys she may have at this time." I keep frowning, but then nod myself. "I will see if she can be recovered or too far gone. Nod to him, then head south where he pointed. You travel through the forest, the daylight reflecting off your armor, your sun pendant pressed against your skin. There is a cave up ahead, all in quiet around it, not even a bird dares chirp. Ready my hammer, scan the surroundings of the cave. Any sentries I can see? You can not see anything out of place, other than the utter silence around you. Your hammer shines in the light, a bit of a green tint from the forest cover. Time to head inside the cave then. Head raised high, and be alert. You enter the cave, its dark and smells of death, descending down a ramp into the darkness, and down a long tunnel, you find yourself at a curve in the caves, there is a door to the right and a short tunnel to the left. Hammer at the ready, check if the door is open. This place reeks of evil. I'm pretty sure no good willed pony would live here anyway. You raise your hammer and attempt to strike the door only to feel a blade slice at some exposed skin on your hoof.. A cloaked pony hissing in your ear "Why have you come here? ", there are two cloaked ponies staring at you awaiting your explanation, one wielding short daggers and the other wielding a primitive gun. Raise my hammer in a defensive position. "I came here to Lilith, the one who wishes to bring foul demons to our world." Be ready to strike at any time. They narrow their eyes at you "Then you have come as our enemy. Prepare to meet your end." The blade user dashes toward you and the ranged fighter is prepared to fire. Roll your actions. "May the Sun have mercy on your souls." The light of Princess Celestia is down here with me, within me. Divine Protection to shield myself from harm, Leap of Faith at the ranged pony. Strike him down with my hammer. As expected he is fast, but you are faster. You slam down your hammer on the melee pony just as he comes with-in range. 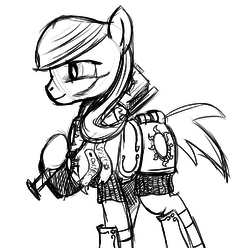 The pony grunts under the force of your strike. Strike with holy Fervor in my actions, break the cloaked cultist while he is still vulnerable! You strike again with the force that only righteous fury would allow you. The pony falls before and the ranged attacker looks concerned. I'll cross that bridge when I get to it. Finish off the fallen one with a heavy strike. You attempt to finish off the pony but the ranged attacker shoots at you, the shots bounce off your magical shield and you smile a little at Celestia's gift to you as you fall down exhausted. You rise to your hooves as easily as breathing, as smooth as the sun rising. "Why not leave?" The ranged attacker says with a gruff tone. The melee attacker is still struggling to get up. "I will not let her to bring destruction upon Equestria with the help of those demons!" Leap of Faith, jump in the range of that ranged pony and surprise him with a hammer to the face. He is not easily surprised, particularly not by the same trick twice. he moves to your left and fires a shot at you. Your armor takes much of the hit, but then it explodes causing more damage. "What some call destruction. We call.. Rebuilding"
I have other tricks to play. "Murder and destruction is not rebuilding!" "You have to clear the area before you can build. That's all we intend to do." He replies back as you charge in your hammer alight with the righteous fury of the sun. it lights up the whole cave as you swing, Knocking the ranged attacker helpless. "Seems like you are a stubborn root.."
"I am the might and will of Princess Celestia. You will not defile her lands." Swing my hammer around and bring it down on the downed ranged pony. He looks a bit scared as your hammer slams down on his front leg. The glow on your hammer bright, like the sun is like a cloudy day, and seems to blind him in such a way that he can not dodge. You release the last of your hammer's holy light with a mighty blow. Both of the ponies cover their eyes but cannot escape the radiant blast of firey light, they scream in pain and the melee attacker passes out. The ranged attack seems unable to move his upper right leg after that attack. Ranged attacker: broken leg. 0/??? "Repent your sins or die." "Lilith isn't worth dying for.. Alright.. how about I tell you something, and you.. let me drag my partner out of here? " Rest the hammer over my shoulder. "…but know this. If you ever stray from the right path and turn to crime or evil sorcery, I will know and I will hunt you down. That time I won't be so open for your redemption. Speak." "Lilith plans to use a cauldron to summon her servant, it requires a very precise mixture to pull this off, if you were to add some rosemary.. the whole thing would be ruined.."
Where can I find any?" "Its a common herb and certainly, the stock room would be a good place to look.."
He glances down the hall. "There is a spare key somewhere around the golem room.. and now that's two things, can I leave?" "Yes. Don't let me catch you ever again. Get a quite life and do something good." Walk over to that door and Shatter it. Your hammer glows pleasantly as you strike the door, splintering the wood and releasing an awful smell of pine and mold. The stock room is full of various ingredients, in well labeled jars. Some of them are grotesque body parts of monsters and other creatures, luckily its all very well labeled, and the there is a table in the back with some tools on it. You easily find it, its located by the other spices, which are all in alphabetical order. You snag a little shaker and fill it with rosemary shavings. This saves me from having to fight the demon. All these ingredients lying around are too dangerous to just be left like this. I have to make sure they can't be easily accessed. Leave the room and collapse the cave on the enterance of that storage room. You aim a careful blast at the top of the door causing a cave-in, they will have to dig past a large pile of rocks to get in the stock room now. The dust settles and you hear a rumble. Roll again. Rolls begin to fall all round you, and fast, looks like you caused more damage than you hoped, your armor takes most of the hits for you, but you will have to find another way out. There is always a way out, too. For now, I have to go deeper. I'm sure you will find a way back to sun. You turn around the short corner, and find a large oval room with four doors, its lit by torches placed periodically on the side, smells of death and.. boiling water and in the center is a golem statue, it glows with a soft blue light when you enter the room. Why do I have a feeling it's not for a warm welcome? Hold my weapon ready, and cautiously advance to a random door. It turns and follows you. The golem figure's eyes locked onto your weapon. The doors themselves have symbols above them. Fire, Water, a Bone, and an Arrow. The boiling water smell is coming from the room with the bone above it. Try the door with the boiling smell if it's open or not, but keep an eye on the statue. The golem pony statue moves toward you, drawing a great axe from its back and placing the large blade between you and the door. For a statue it moves quite fast, and slices at you in return, your pendant activates, letting you know that Celestia is still with you. The bluish glow of the golem is a bit eerie, but this only motivates you even more. Of course it is with me. Divine Protection, and attack again! You strike with an amazing force that only celestia's light could grant you. The golem looks shaken and staggers backwards. You attempt to break his armored shell with your hammer but leave yourself open to attack, the statue's great axe slamming into you, you will feel this later, but now, now you must go on, the warmth within you demands it. Step back to create some distance, and Bolster myself. Yes just a statue, the statue studies you as you prepare yourself for the oncoming fatigue. Perhaps the warmth in your chest is not residual sunlight.. You fall to the ground and the statue follows you with its bluish glow. The smell of the boiling water changes to smell a bit like.. something cooking, similar to a spicy tomato soup, but with a smell you can't place mixed in. Get back up, I'm wasting too much time! With the golem pony looming over you, you rise to the challenge. The Pony Statue hoists its axe prepared to strike you. Not if I strike it first, Blast it! You go in for a righteous attack, but the golem is able to hit you first. You feel the crushing force of the blow as it hits you. While you are getting pummeled by this golem, you note that the floor has runes that mean 'lock' most likely, he can not leave this circular room. You finally manage to strike it, The golem pony's body echos the sound your strike, as if you had struck an empty hallway. The golem steps back and raises its axe at you again. looks like an uppercut was the wrong move, the axe falls onto your shoulder hard forcing you down. You feel perhaps a little dizzy. an old thought echos in your mind, a guiding voice of sorts. Remember your training radiant, swing your hammer with purpose. Grit my teeth and stand up! To make sure peace and happines is everywhere! To see the smile of the Princess! Yes, you remember your purpose now, you get up again with renewed focus, the Golem pony's eyes staring at you. I wonder if it can be surprised. 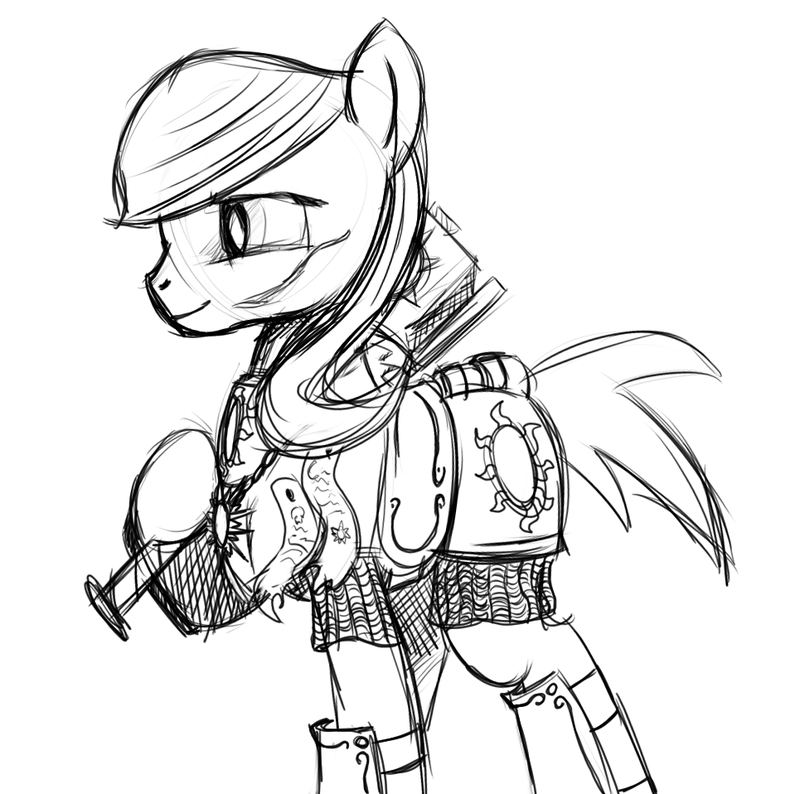 Leap of Faith, nopony expects a fully armored bulky mare to be able to jump at them like that! You leap into the air and land behind the golem pony, now able to land a decent blow you once again hear that echo when you do so, it looks like you are starting to make an impact. It takes the golem a moment to spin back toward you. You charge up your hammer for a magical strike and find yourself instead meeting that giant axe against your armor. You fall to the ground again. The golem stands back observing you. "You are tougher than you look…"
The golem pony nods as you struggle to get up. full of determination you start to get up, but you twist your hoof and fall back down again, you land hard on the ground. You struggle to get to your hooves, you feel yourself breathing heavily, the golem looks toward you, but then its gaze seem to be piercing past you, to the door with the bone marking, where the intoxicating smell of something grows stronger. You feel sick, and tired… is that blood on the ground.. your blood? Let out a bitter chuckle. Look at you, Radiant, done in by a statue when you have gone through hell. At least try to make it count. Stand up. You can not find the strength. The blood pooling around you seems kind of pretty. Glanincing up you see the Golem, its bluish glowing eyes looking down on you with what you could swear is pity. Its axe raised above you, you close your eyes and imagine her. Perhaps it is time, time to embrace the light, to be by her side forever, that smile surely will follow you into the afterlife.. surely you have earned heaven..